Abstract: Spheronization is a rapid process for production of microspheres. The process involves the dry mixing of drug with microcrystalline cellulose (MCC), which on subsequent wetting with water forms a plastic mass suitable for extrusion and spheronization. As in any pharmaceutical operation, large number of factors may affect the production of pellets, which can be related to formulation or processing machinery. Among the factors related to spheronizers is the spheronization plate design. 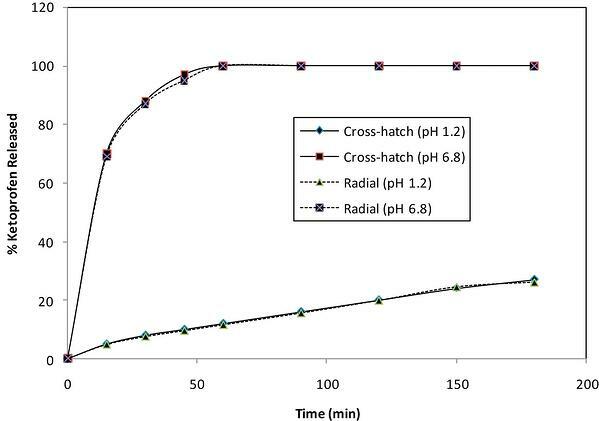 This work is aimed at evaluation of the effect of using the radial design and the cross-hatch design on product quality through a factorial experiment using ketoprofen as a model drug. The factors studied were MCC level, spheronizer speed and spheronization time. The evaluation methods included sieving analysis, density and porosity measurements, shape analysis, and dissolution testing. Preliminary experiments revealed that MCC level is of great significance on pellets yield. Also, all the produced pellets were of acceptable sphericity score. The factorial experiments showed that an increase of pellets yield of desired size can be obtained when using the radial design of friction plate, while no significant changes were found regarding density, porosity and dissolution rate.